What do you do when you get an extra day in February? Bake kale chips of course. I have been hearing about it, seeing it on TEDX talk and on blogs, etc. so I took the leap and baked some kale chips. Through trial and error I learned that the best temperature to bake the chips is not high, rather low and slow. I started with 350deg F and end up with 260 deg F. By the time the kale is cooked, the water is gone and kale is crunchy, salty and oh so light. I feel I should warn you that it is addictive and no matter what time of day it is made, you cannot stop eating it. 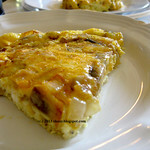 I had mine with a glass of wine after dinner today and the combination was ah so good! 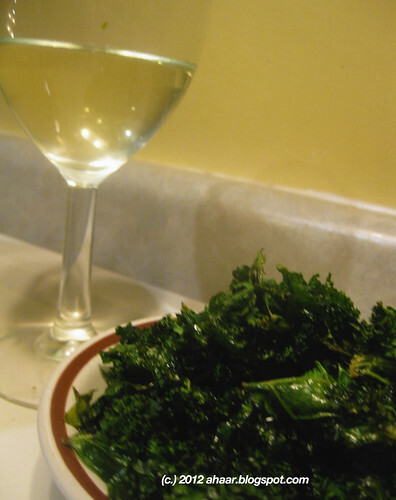 The real investment in this recipe is time depending on what temperature you bake the kale. 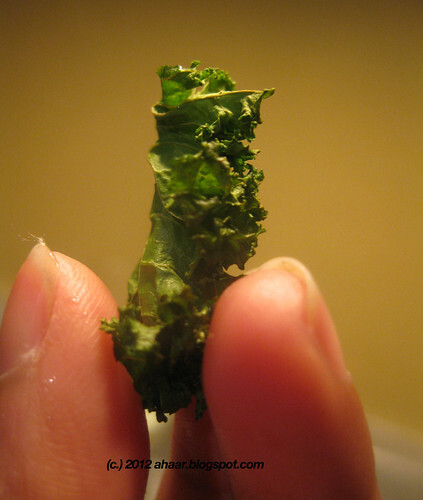 Heat the oven to 260deg F. Clean the kale taking away thick stems and making sure that the leaves are dry. 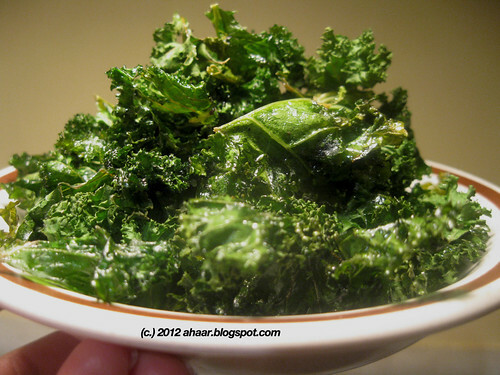 Mix the kale with olive oil, salt and pepper and put the kale in a cookie sheet. Cook it for 15 min, take it out and turn it around. Put it back in the over for another 12-14 minutes till the kale leaves just crush nicely between your fingers. 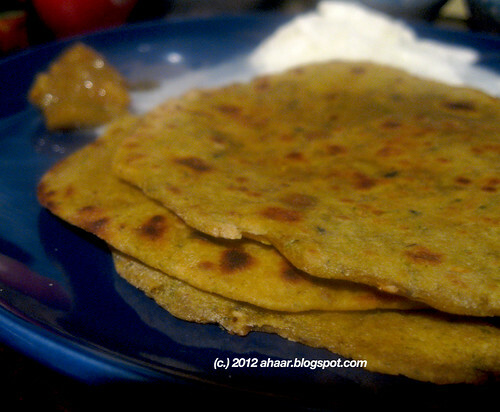 Actually leftover dal parathas ! Last week when I peeked in my fridge there were two little boxes sitting wait to be picked up for the 3rd day in a row. So this time I did! 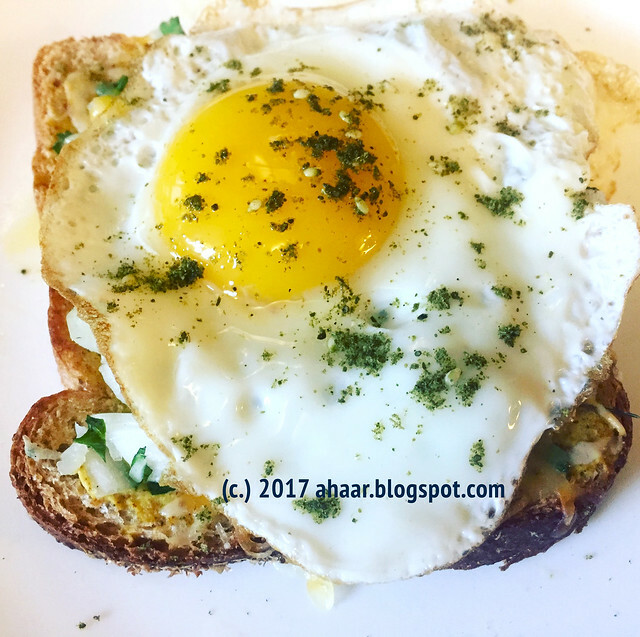 One had a little bit moong dal and the other one was masoor. 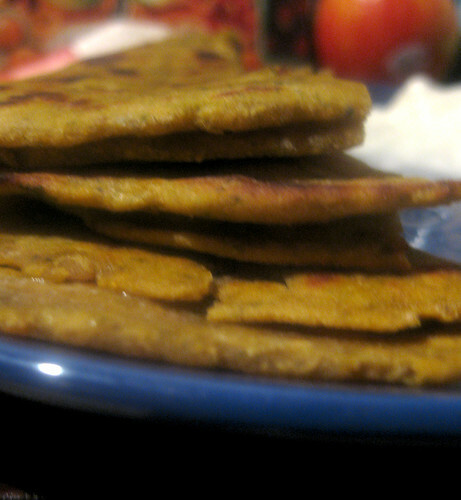 I mixed it up with some flour, grated onion, cilantro and salt and it made for some yummy dinner parathas. Little A ate all his share with jam and we enjoyed ours with yogurt and pickle. Knead it all together. First mix the dal, cilantro and onion well and only then start to add the water. Dal already has salt, so check and add more if needed. Knead it to a soft dough and keep it aside for 30-40 minutes. Divide the dough in equal parts and then make balls. 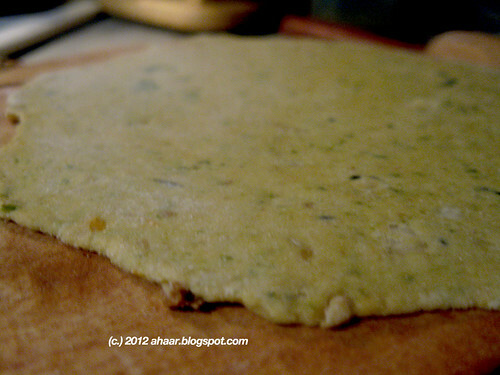 Roll out the in circular parathas, use some flour dusting if it sticks, but not too much. Heat a hot griddle or pan, cook both sides, put a tspoon of oil and cook till the brown spots appear and the paratha looks cooked. 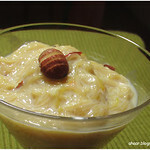 Serve hot with raita, pickle or jam! Enjoy. You know how you've just had enough of the regular meals and want something different sometimes. It was during those moments I picked up one of my cookbooks. 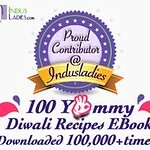 Nowadays, I just find recipes through blogs and haven't used my books. But it was one of those days and I pick up "Vegetable Heaven" looking for inspiration. 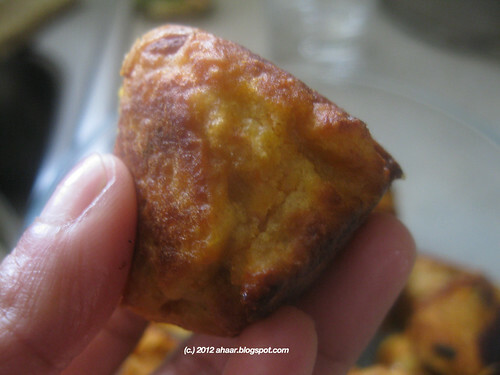 And when I found this recipe, my eyes lit up. "Just the thing I was looking for" I thought and coincidentally, had all the ingredients at home. I tweaked it little bit, like every time, to match our tastes and it came out great. I made it again for Lil A's birthday and it was just as delicious. Boil the sweet potatoes for 8-9 minutes till then are soft. I used a canned chickpea and put it in the same boiling water for the last 3-4 minutes. 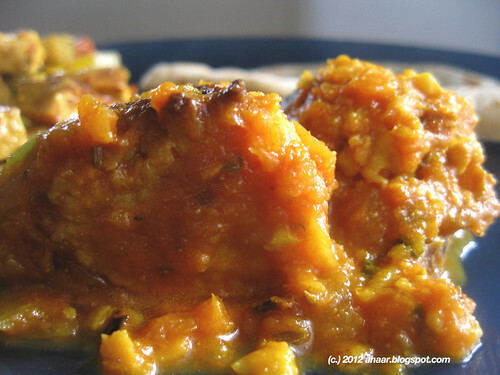 Take out the skin of sweet potatoes and mash it with the chickpeas. Add 1tbspoon besan, 1/2 tspoon coriander, and cumin powder, 1/4 tspoon turmeric powder, and red chilli powder and chopped cliantro and salt. Mix it well with your hands. 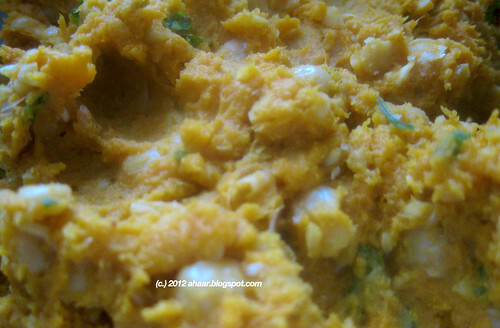 I don't completely mash the chickpeas and leave them coarse. If you want a smoother paste, you could even use a food processor. Then make small balls using about 1 1/2 tbspoon of the mix. You should get about 10-12 koftas. I didn't deep fry it, but shallow fry in a deep pan on low heat till they brown nicely. Keep them separate. Then in a sauce pan, add 1 tbspoon oil and temper it with cumin seeds, green chillies, and bay leaves. Add the grated ginger, saute for a minute and then add in the onion and tomatoes. Add in the rest of the coriander and cumin powder, turmeric and salt, about 1 cup of water and let it all cook together for 6-8 minutes on medium heat till it all mixes and comes together as a gravy. Add in the kofta balls and let it cook for a minutes and take it off the heat. 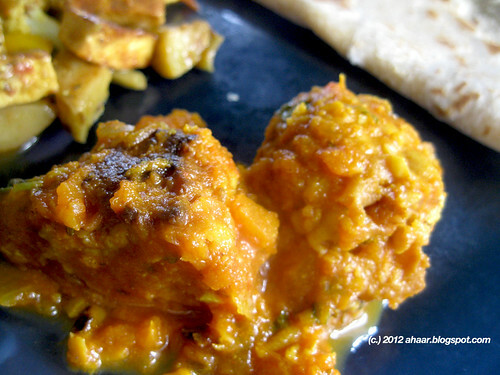 Serve warm with hot rice or chapati, or parathas. 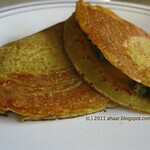 We enjoyed ours with mixed paneer and chapatis.